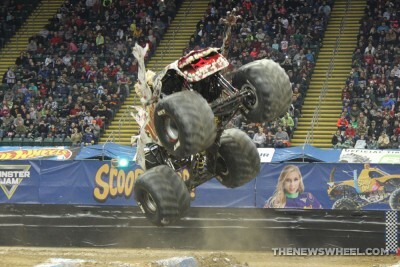 Very few sports are tuned to its fans’ feedback as much as Monster Jam is. 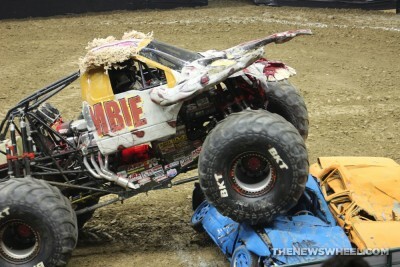 Monster truck themes used by the motorsport organization are often fan-selected, which adds to the appeal of the events and its trucks. A couple years ago, fans were given several new truck design options and encouraged to vote for their favorite online. 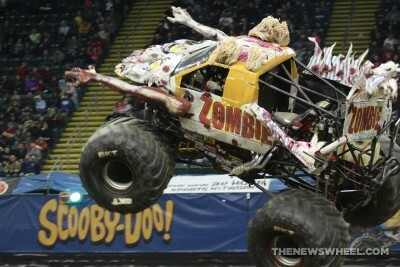 Zombie was the truck theme voted to “come back from the dead” and quickly became a reality in Monster Jam arenas. 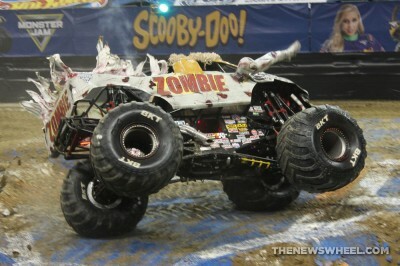 The Zombie monster truck was built in 2012 and debuted in 2013 piloted by Sean Duhon. 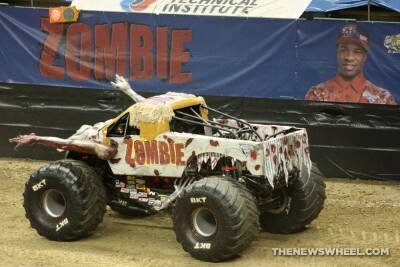 Zombie quickly became a crowd favorite, with fans and drivers dressing like zombies at events. In 2013 and 2014, Zombie participated in the World Finals held in Las Vegas. 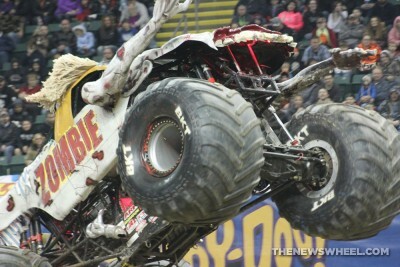 In 2014, Zombie added arms to the sides of the truck; its tires featured blood decals in 2013, but those were later removed. 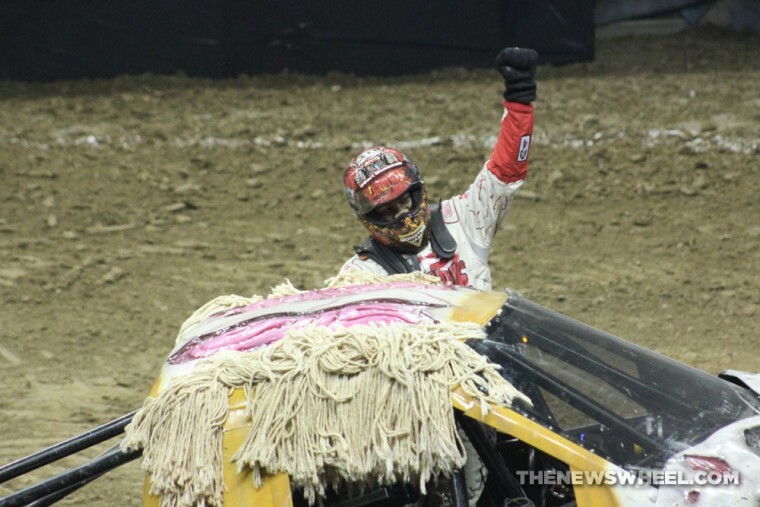 In 2015, Bari Musawwir and Tyler Groth both drove Zombie trucks, as there was a Zombie encore at that year’s World Finals. 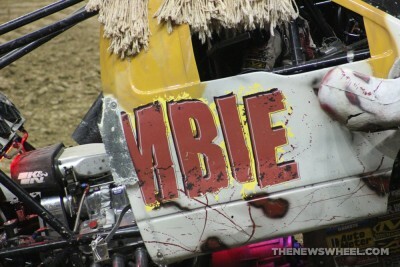 Many Zombie trucks were there, with different paint schemes, hair styles, and arms. 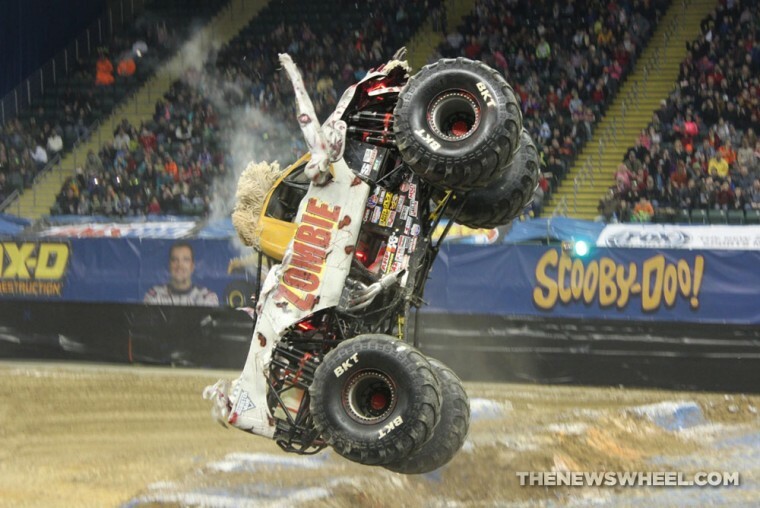 Currently, Tyler Groth represents the West Coast Monster Jam Zombie with the yellow truck and Bari Musawwir represents the East Coast Monster Jam tour in the skeleton Zombie vehicle. 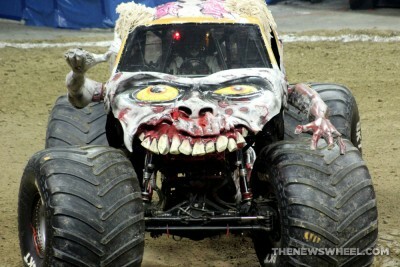 The News Wheel recently saw the East Coast Monster Jam tour featuring AMSOIL Vehicles and was thrilled to see the skeleton Zombie truck driven by Bari Musawwir entering the arena as Michael Jackson’s “Thriller” played over the PA system. Musawwir sits in the center of the vehicle as the driver’s seat is centered for operators to see the track and have equal weight distribution. When we spoke with him in our exclusive interview, Musawwir explained that the seat is custom-molded to his body for optimal protection and has head- and neck-restraints with a five-point body harness. 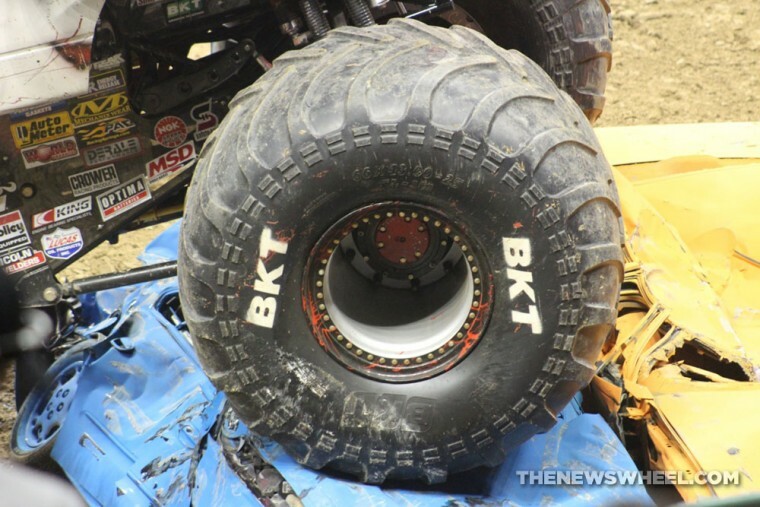 You can find more detailed technical specs on Monster Jam trucks here. 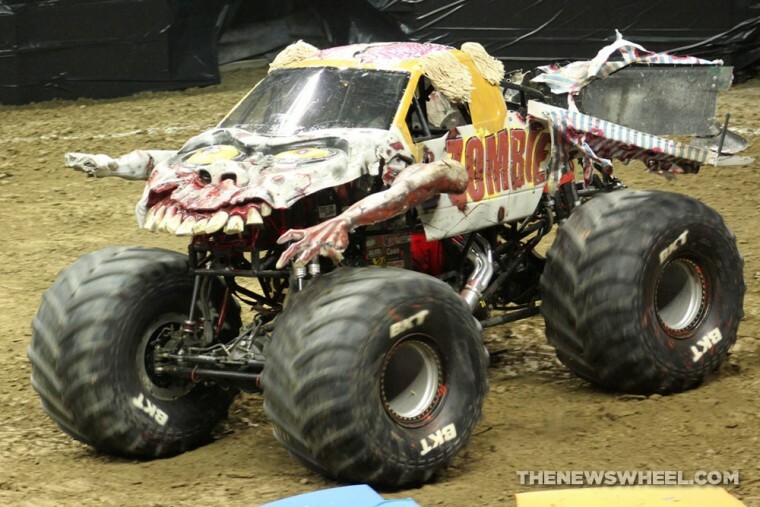 The Zombie truck definitely is a crowd favorite wherever it goes—inspiring audiences to “do the zombie dance” by moving their arms up and down—and we at The News Wheel are glad we got to speak with Bari Musawwir and root for Team Zombie. How big of fans have we become of this awesome truck and its driver? The official Hot Wheels Zombie trucks on our office desks can answer that. Vicki Widmar is from the small Ohio town of Prospect. As a science and English teacher who also writes curriculum for a post-secondary program for adults with disabilities, Vicki loves writing about a range of topics, including the automotive industry. When not in front of a class or behind a computer, she enjoys being outside and exploring new locations with her husband and her 2014 Hyundai Elantra. Vicki is eager to share her stories with anyone who will listen—including her experience learning to drive in a manual-transmission 1986 Isuzu Turbo.